Hey y’all – I hereby declare August Skirt Month on the blog! 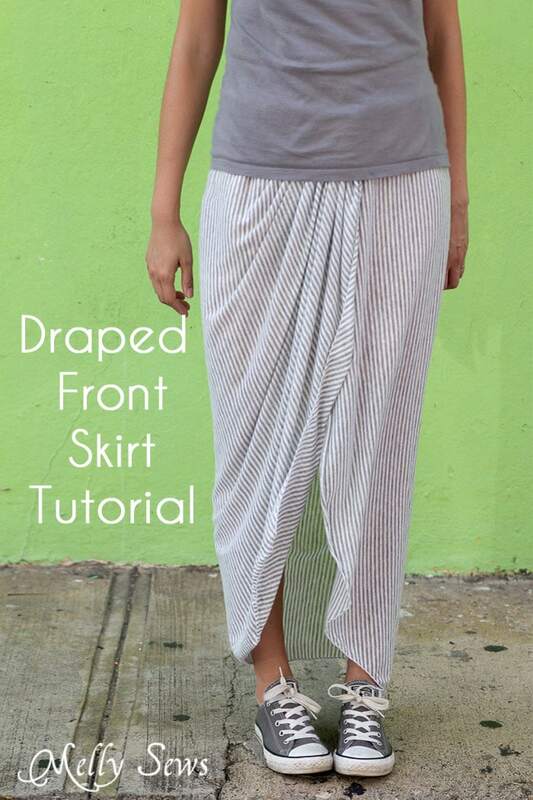 To kick things off I’ve got a draped skirt tutorial for you. 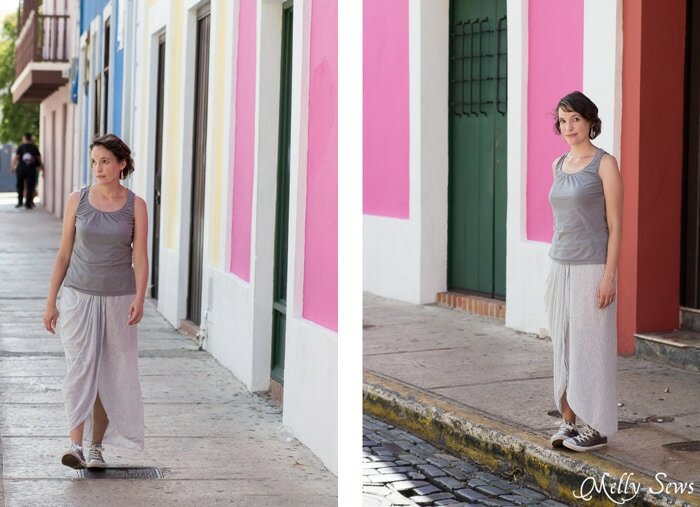 We were lucky to take a trip to Puerto Rico in June, and though it was very, very humid and hot, I really loved the architecture and color in Old San Juan. Wandering the cobblestone streets felt a lot like wandering a European city, and I was glad to have both a breezy skirt and comfortable pair of shoes while we looked around. This skirt is made with a knit fabric that I used on the cross grain because 1)it had a little vertical stretch 2)I liked the stripes and 3)for this skirt it doesn’t really matter if you use a stretch or woven fabric. Either will work, I just liked the drape of the knit fabric. 1/4 yard of ribbed knit fabric for the waistband. 1 yard of 1 1/2 inch wide elastic. 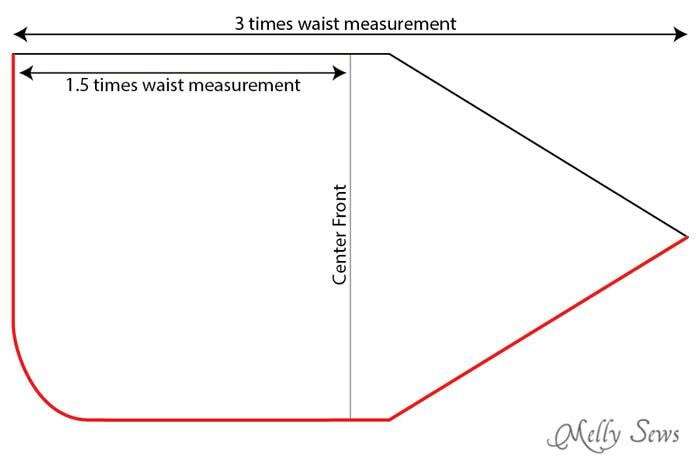 Cut 1 or two pieces of fabric so that you end up with a flat piece of fabric that is your desired length and 3 times your waist measurement. 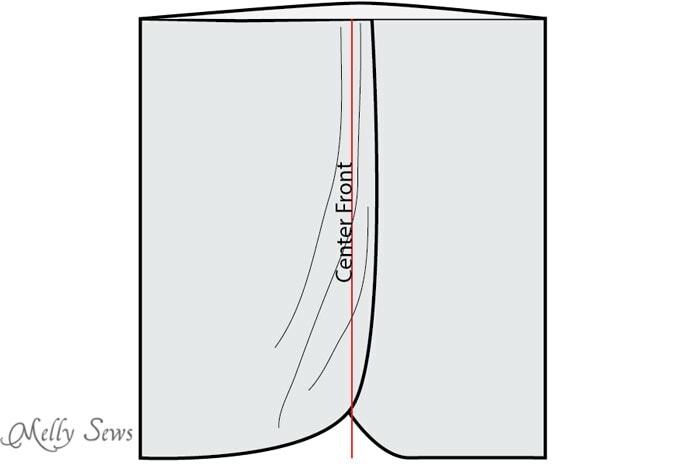 (Need some guidance about lengths and other skirt measurements? 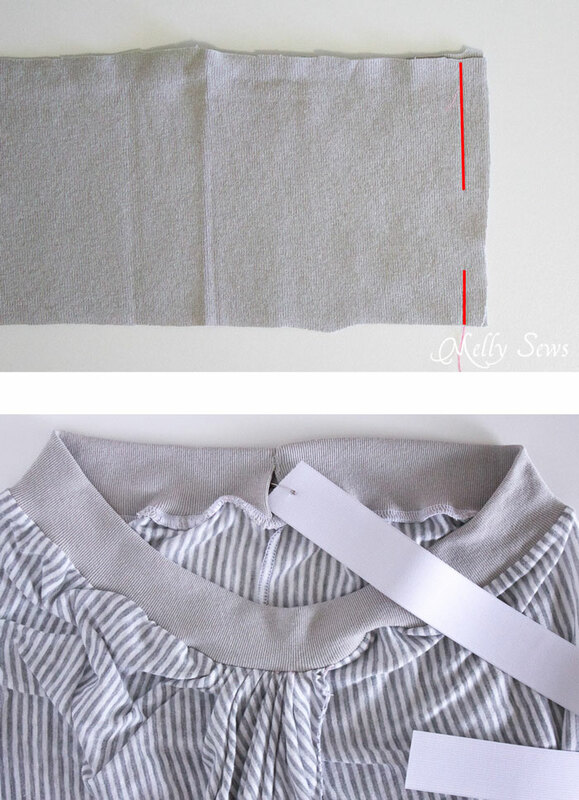 See this post on how to sew skirts – there’s a chart in there you can download). 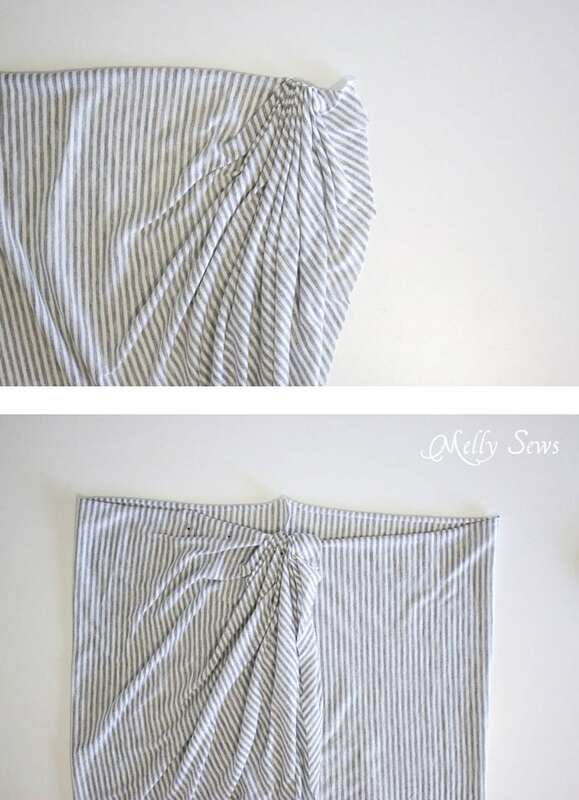 You may have to sew panels together to get the final size fabric needed, and if you do that’s OK.
Once you have your fabric, you’ll want to shape it like the image below, cutting half the skirt into a point and rounding off the other bottom corner. 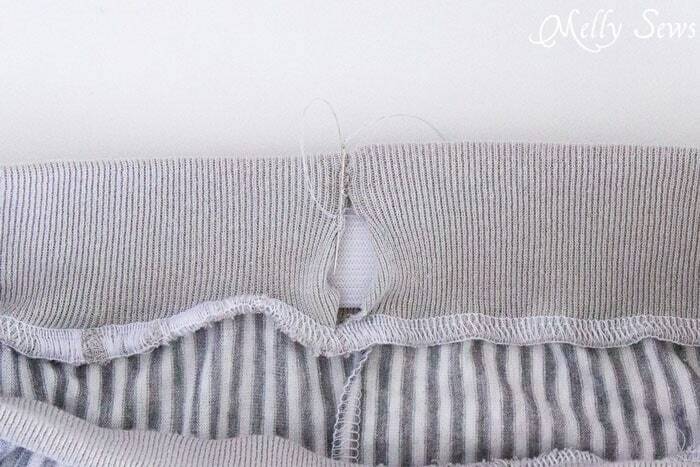 If you’re using a fabric that needs a hem (knit doesn’t), you’ll want to hem before moving on. Sew a rolled hem all along the red edge of the skirt panel. That long triangular extension piece is what we’ll gather up to form the draped front of the skirt. I didn’t bother with gathering stitches, I just hand pleated and bunched the top edge of the extension, pulling it up to be even with the top of the rest of the skirt, as shown below. When you’re done, that edge should look like the image below. You can either baste or pin these gathers in place. Now fold the skirt, wrong sides together, so the gathered/draped edge is on top of the flat edge of the skirt and they overlap about 4 inches at center front. There’s a picture of this step above and a diagram below to help make it clear. Pin the front layers together and baste the overlap. At this point the skirt is still wider than your waistline. The next step is to cut a piece of ribbed knit that is 4 1/2 inches wide and the same length and your waist measurement. This piece should stretch lengthwise. Fold the waistband in half, right sides together, matching the short edges. Sew from the top edge down 2 1/2 inches, backstitch, lift the needle and move the fabric 1 inch, then put the needle back down, backstitch, then sew the last inch of the seam. 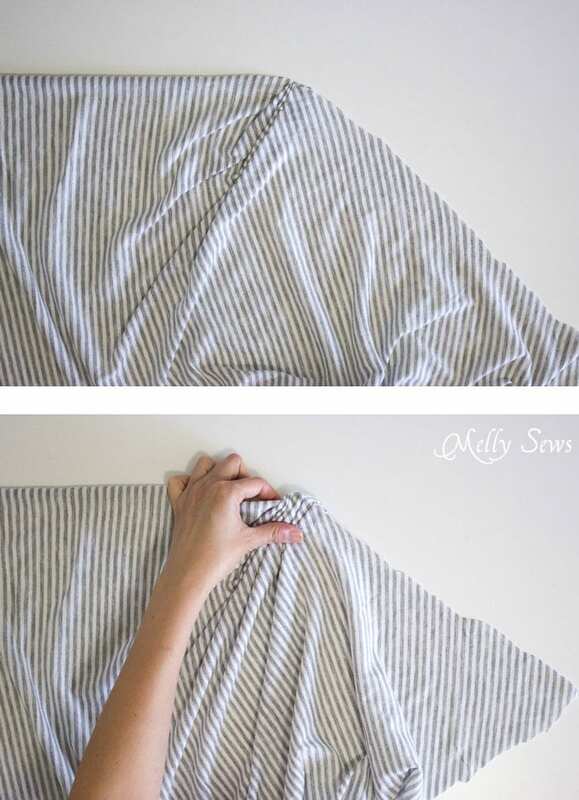 Fold that waistband into a loop, wrong sides together and matching raw edges. Press. Pin the waistband at the center front, back and sides to the skirt, right sides together. Stitch through all layers (skirt and both waistband layers) stretching the waistband to match the width of the skirt. Insert elastic through the hole you left in the center back seam. Use a hand sewing needle and a blind stitch to sew the opening in the waistband closed. And you’re done! 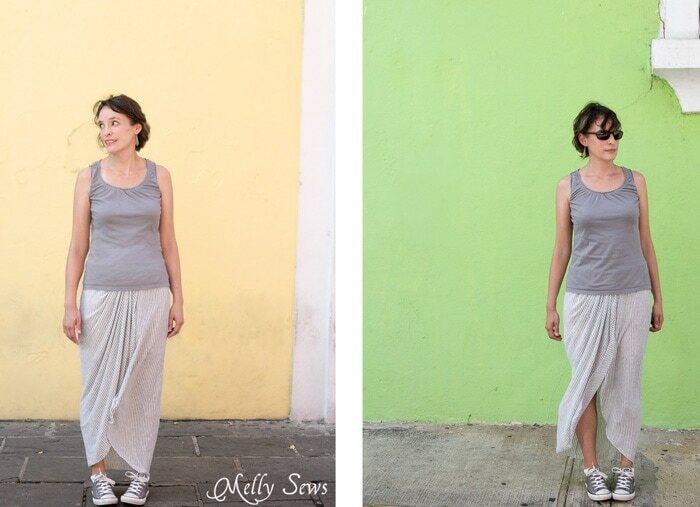 Find some brightly colored walls and go pose like a tourist. I love that you do themes each month. It makes sewing so much more fun! And this skirt is so perfect for the end of summer. Thanks for sharing a simple pattern! The skirt looks great on you! Thank you for the tutorial. Great tutorial! 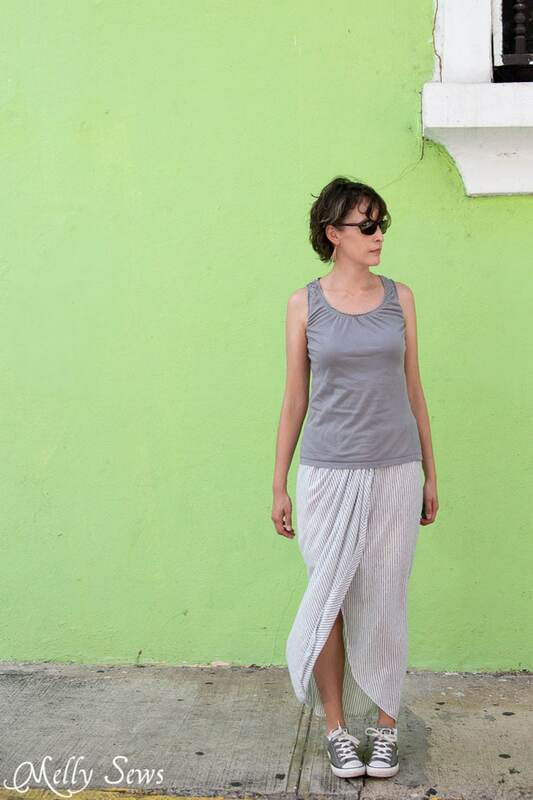 Simple and you don’t have to worry about a straight hem line at the bottom. You are SO talented, and you make things look so easy! Thanks for sharing. 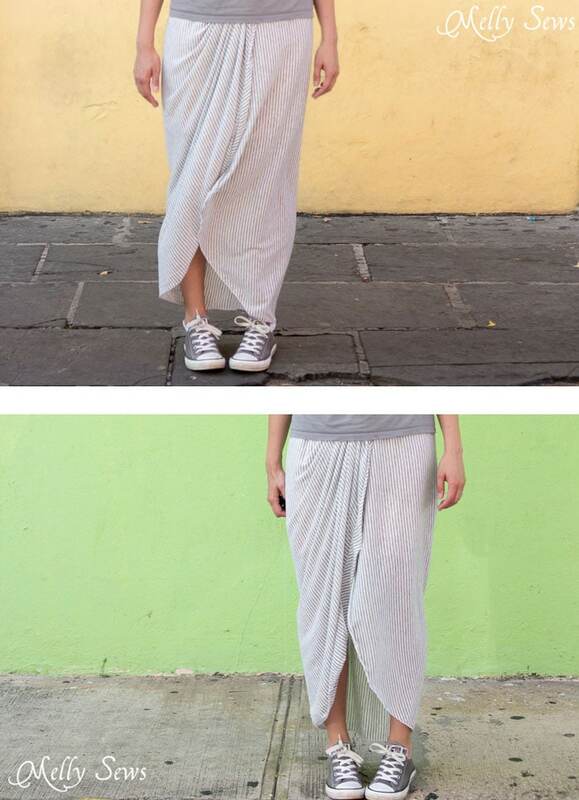 LOVE this skirt & it looks especially GREAT w/ your shoes!! Thanx for the tute I’m excited to get started!! Thank you! I am repurposing an oversized bridesmaid’s dress to go to a disco party and this is perfect to get that drapey front gather! !